President Donald Trump meets with outgoing U.S. Ambassador to the United Nations Nikki Haley in the Oval Office of the White House, Tuesday, Oct. 9, 2018, in Washington. Haley needs no excuse. 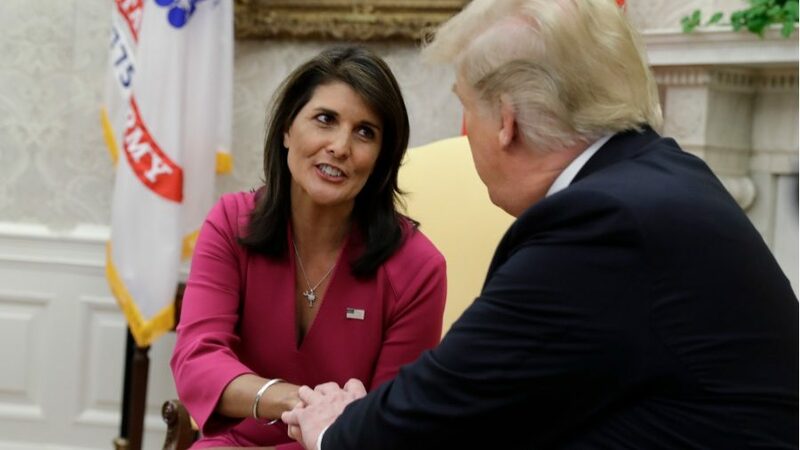 Haley maybe a novice in world politics, But has done more than anyone since Monyihan. Haley is fighting a continuous operation without relief. A war, the deep state and globalist want U.S. to lose. Love her. What a strong woman! Sad to hear her go. No surprise if she has been incessantly harassed by those opposing. I do not trust her at all.